Want More Customers at Higher Prices? Help yourself to more than 100, free, equipment-strategy articles. Check out our two capital-equipment-strategy books. Develop a critical mass of understanding fast. Don’t go it alone. Perfect for product and marketing managers. Want more customers at higher prices? Get Your Price! 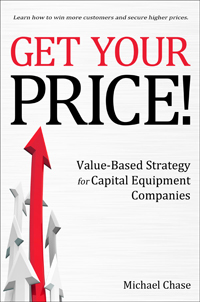 is the first-ever book that shows you how to implement a value-based strategy in a capital equipment company. Like any good coach, Mike got the best out of me. Plus, I added new skills and learned new approaches that will help me on future projects. Thanks, Mike! I look forward to the next time we can work together. Since working with Mike and adopting a value-based strategy, we’ve literally added millions of gross margin dollars to our bottom line each year. Mike’s coaching was excellent! It didn’t matter whether we were tackling a pop-up issue, developing an MRD, or formulating a voice-of-the-customer plan. Mike’s guidance was always appreciated, useful, and actionable. Capital equipment companies source most of their strategy and marketing professionals from their technical ranks. Almost without exception, these incredibly capable professionals have the formal, technical education necessary to master complex, capital equipment and its applications. But they are often left on their own to figure out how to capitalize on promising opportunities, grow their businesses, and compete. In 2006, I formed Tekcess International to help capital equipment companies solve that problem.